Balfron Tower is a 26-storey residential building in Poplar, a district of the London Borough of Tower Hamlets in the East End of London. It forms part of the Brownfield Estate, an area of social housing between Chrisp Street Market and the A12 northern approach to the Blackwall Tunnel. It was designed by Ernő Goldfinger in 1963 for the London County Council, built 1965-67 by the GLC, and has been a Grade II listed building since 1996. 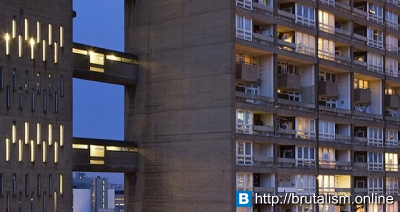 Balfron Tower is 84 metres (276 ft) high and contains 146 homes (136 flats and 10 maisonettes). Lifts serve all entry floors (that is, every third floor); thus, to reach a flat on the 11th, 12th or 13th floors, residents or visitors would take a lift to the 12th. The lift shaft sits in a separate service tower, also containing laundry rooms and rubbish chutes, and joined to the residential tower by the eight walkways visible in the picture. The service tower is topped by a boiler room. In 1985 the original concrete boiler flutes were replaced with metal, due to concrete decay. Carradale House (1967–70) is an adjacent, unique, modernist building, also designed by Ernő Goldfinger and Grade II listed. The two buildings appear to be natural extensions of each other, linked by style and design, with the long, low form of Carradale House complementing the height of Balfron Tower. All flats have dual window aspect and large south facing balconies, allowing plenty of natural light, and decorated with natural wood panels on the sides. The block is 37 metres (121 ft) tall with 11 floors, and contains 88 flats. The building has a similar podium to Balfron Tower, albeit more extensive with a large underground car park underneath. It too has sky bridges on the same principle of access at every third floor. After designing Balfron, Goldfinger identified all the possible improvements and incorporated them first in Carradale House and afterwards to Trellick Tower. Like Balfron Tower, the robust nature of the detailing to this building has helped it to weather the passage of time. Carradale underwent an extensive and careful renovation, that lasted three years under the supervision of English Heritage and the direction of PRP Architects. The two blocks were known as Rowlett Street Phases I and II during development before being named after the Scottish villages of Balfron and Carradale, a pattern followed in naming other locations on the nearby Aberfeldy and Teviot estates. Ernő Goldfinger himself was pleased with the design of Balfron Tower and moved into flat 130, on the 25th floor, for two months in 1968. He and his wife threw champagne parties to find out what the residents liked and disliked about his design. 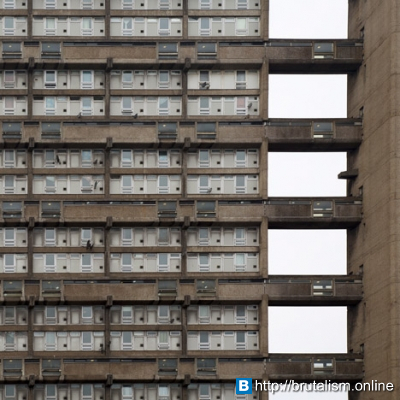 He applied what he learnt to his design for the similar Trellick Tower in West London. Goldfinger's studio later added Glenkerry House on the same estate, complementing Balfron Tower and Carradale in style. The building was given Grade II listed status in March 1996, followed by Carradale House in 2000. Carradale and Glenkerry Houses were also included in the Balfron Tower Conservation Area, designated in 1998. 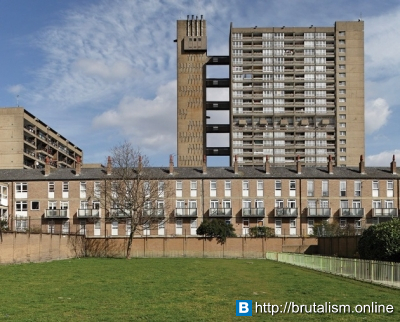 The listing continues to attract comment, especially in view of the failure of another nearby Brutalist estate, Robin Hood Gardens, to obtain the same protection. 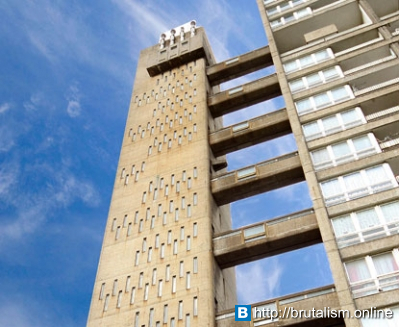 In recent years Balfron Tower has been popular with visitors during the annual Open House Weekend. 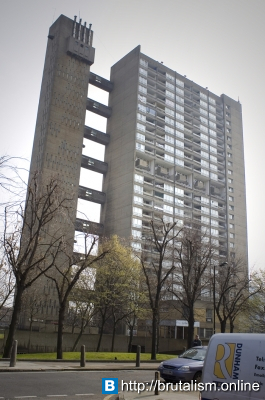 In December 2007, following a ballot of residents in 2006, Tower Hamlets Council transferred its ownership of Balfron Tower, Carradale House and the surrounding Brownfield Estate to Poplar HARCA, a housing association. Poplar HARCA is currently carrying out a full refurbishment of the buildings. The architectural firm PRP which has taken up this project is looking to restore these Brutalist structures to their original form as required by English Heritage, and also to bring the buildings up to modern specifications and 21st century living standards. The refurbishment is technically challenging, due to the need to install new services without disturbing the listed exterior. The solid concrete design also suffers inherently from cold bridging, which has to be remedied by internal wall insulation. Residents were to have the option to keep their flats in the blocks, or to move into new low-rise homes nearby, in which case the vacated flats would be sold to finance the works. However, in October 2010 the residents of both blocks were sent notice that the refurbishment would require all residents to move out, due to fire safety and other risks, with no undertaking on whether they could return. The first phase of the refurbishment started in November 2011 with the lower block, Carradale House, and the works are due to finish April 2014. Key features of the refurbishment include: replacement of existing windows with high-performance examples matching original pattern; upgrade of thermal performance using materials to provide insulation and vapour barriers; efficient gas-fired boilers for replacement communal heating system; and new wet services, incorporating water conservation measures. Internally, communal spaces and flats are sensitively refurbished in keeping and without altering Goldfinger's original layouts and heritage features. These embody key considerations related to restoring the key elements of the original scheme, undertaking repair and replacement on like-for-like basis, ensuring a lifespan of at least 30 years, taking advantage of a once in a lifetime opportunity to scaffold the entire building and upgrading as far as possible to accord with modern standards. This will ensure its future effectiveness and desirability as a place to live. The Housing Association (freeholder) Poplar Harca's budget is in the region of £10 million and leaseholders are asked to contribute around £50,000 per flat for all the major works that are taking place during this refurbishment. Works at Balfron Tower are due to start after Carradale House is completed in May 2014. Poplar Harca is to enter a joint partnership with Londonewcastle, a luxury residential developer, to refurbish Balfron Tower. Pending the works to Balfron Tower, some flats are temporarily occupied by artists, who contribute to the community and put on displays in "heritage flat" number 123. A major photographic project was undertaken in November 2010.